Automotive Technician vs Collision Repair Technician: What’s the Difference? Car lovers considering their career options in the automotive field often find that more than one program offered by a post-secondary school piques their interests. To help those torn between pursuing automotive technology and collision reconditioning technology, Automotive Training Center (ATC) put together the following guide to the differences between training to be an automotive tech vs. training to be a collision repair tech. Find out which program is the better match for you below. Automotive technicians receive training that’s focused on the knowledge and skills required to diagnose, service, and repair foreign and domestic vehicles. As masters of routine vehicle maintenance, automotive technicians are challenged to learn and know a vehicle’s internal systems inside and out and be able to connect the dots between symptoms to identify when a deeper problem is present. They’re often tasked with changing a car’s oil or rotating the tires, as well as performing more intricate procedures like troubleshooting a transmission problem or replacing a part in the engine. Job setting: Automotive technicians typically work in a dealership’s service center or a smaller repair shop. Other career avenues: engine rebuilder, auto or tools salesperson, service advisor, parts consultant. Look for: a program taught by ASE-certified instructors. 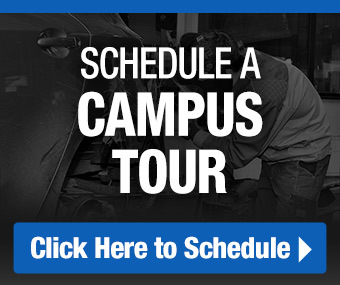 Learn more: Explore deeper on what it’s like to be an automotive technician here. Collision reconditioning technology students cover similar criteria that automotive technology training teaches with an emphasis on structurally repairing and refinishing a vehicle in the aftermath of an accident. Collision repair is considered a more specialized discipline and focuses on procedures and practices, such as frame reconstruction, body repair, welding, and paint matching. From initial damage to just like new, collision repair technicians in training learn everything they need to know to evaluate, reconstruct, and perfect a vehicle back to its manufacturer-recommended specifications. Job setting: Collision repair technicians often work in a dedicated collision repair center. Other career avenues: insurance appraiser and/or adjuster, auto or tools salesperson, custom painter, restoration technician. Look for: a program taught by ASE- and I-CAR-certified instructors. Learn more: Find out about the roles and responsibilities of a collision repair technician here. We hope this explanation helped you better understand the differences between automotive technology training and collision reconditioning technology training and the various career paths they lead to. What’s perhaps most exciting is both roles provide you with the opportunity to work with your hands, actively problem solve, and work in a field that’s in high demand. If you still have questions about pursuing training as an automotive technician or a collision repair technician after reading this post and the provided resources, we encourage you to find a training center that offers both programs and attend an open house. Seeing the equipment up close, chatting with instructors, and hearing from former students is a great way to take a test drive of each program. Check out these tips for locating a repair shop near you and getting a fair repair estimate brought to you by Automotive Training Center. This entry was posted in Automotive Technician Training, Automotive Training Center on by ATC.